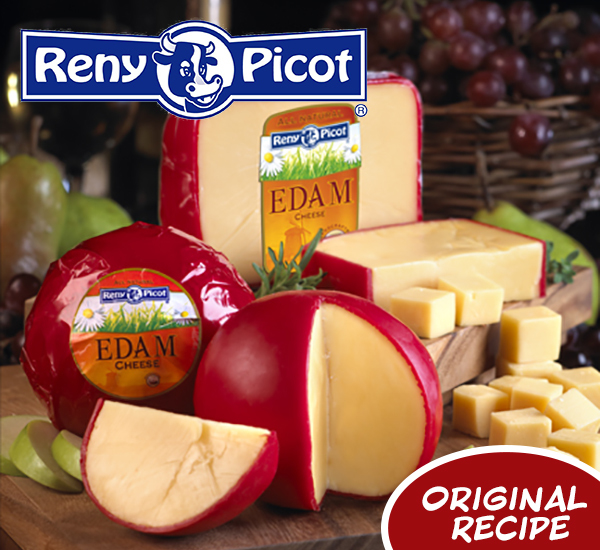 Picture this: Reny Picot Edam bubbling over the tops of bright, juicy apples bathing in an sweet and sultry sauce to bring out a new dimension of flavor and all around irresistibility. The hazelnuts bring the crunch and a touch of thyme adds a welcome savory note, transforming these baked apples from a humble fruit to a quietly refined dish. You’ll Edam up! Grease 9×13-inch pan and preheat oven to 375°F. Cut apples in half from top to bottom. Hollow out a small hole in center of each half, removing the core. Lay apples in greased baking dish cut side down and drizzle with apple cider. Bake 15 minutes, until apples begin to soften. Remove apples from oven and turn each over in pan. Add red wine and sprinkle in thyme. Fill each hollowed core with Reny Picot Edam, piling additional cheese on each top. Return pan to oven. Bake 15-20 minutes, until cheese is melted and bubbly. Remove from oven and top with hazelnuts. Transfer apples to serving plate, drizzle with remaining sauce from pan, and serve.